We were enjoying some family time at a nearby beach. I rested on the blanket while the others continued to swim around. While sitting there, I observed a fully clothed little girl run into the water. The next thing I heard was a mom screaming at this little girl named Abby for going in without asking. Her words continued to escalate and Abby wilted. As I watched this all unfold, I felt so sad for the little girl but more so for the Mom. I agree Abby shouldn’t have gone in the water without asking. But, her Mom could have been more kind about it. I also hurt for Abby as she heard her Mom say “I can’t even deal with her.” That is so hurtful to anyone but especially a child in her formative years. As I sat there and reflected, the Holy Spirit spoke to my heart, “How many times have you acted just like this Mom?” Ouch! I was convicted. I would like to say never but unfortunately, I have been that Mom. The Holy Spirit softened my heart and encouraged me to be aware of my words with my kids. The beach story reminds me of our scripture verse for today. “What you say flows from your heart.” This verse challenges and convicts me. What is in my heart if my words are tearing others down? How about you? What is in your heart? I know that without Jesus, what flows from our mouths would not be uplifting. That’s why we need to daily spend time in God’s word which fills our hearts with truth to dwell on. We need to ask the Holy Spirit for His guidance throughout the day to keep calm even when we feel like losing it. 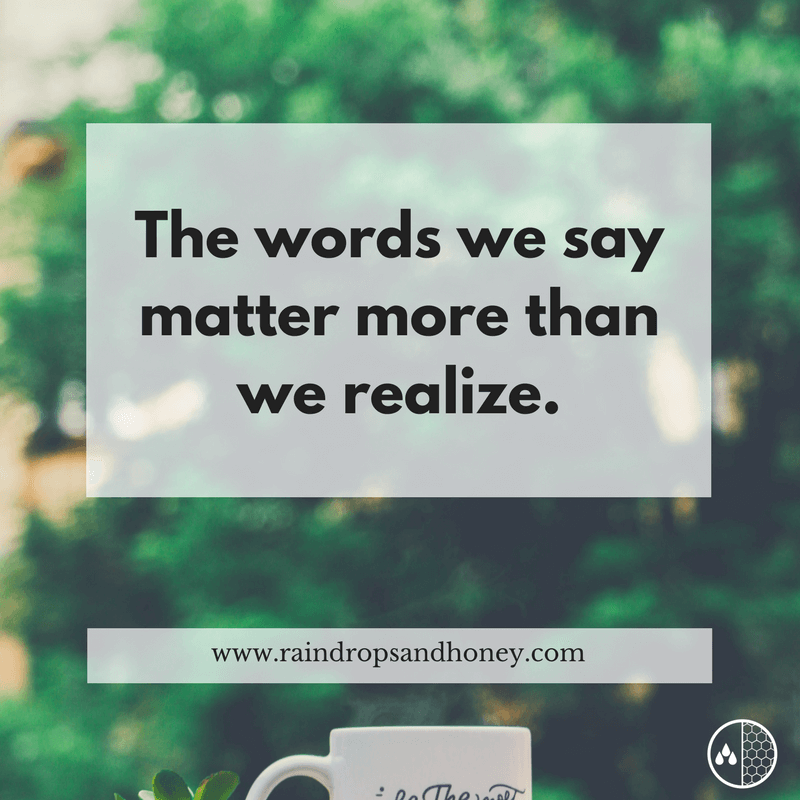 The words we say matter more than we realize. We can use our words to tear down or build up. Let’s replace our “I can’t even…” statements with the truth. We can with the Holy Spirit. Let’s lean into Jesus every day and spend time in His word. Jesus will help us speak words that bless and encourage. Heavenly Father, I need Your help with my words. I long for the overflow of my heart bring blessing to others. Help me to be in the Word daily to let Your truth sink in. Thank You, Lord. In Jesus’ name, Amen.